London: For James Rivington and James Fletcher, 1759. 2 volumes. First Edition in English and the first translation of this work out of Spanish. With a large folding map of California based on the Jesuit map and eight illustrations on four copper-engraved plates. Note that very often, there are only 2 copper plates and occasionally even fewer found in copies of the book. 8vo (197mm x 122mm ), in contemporary bindings of full polished calf, all boards with a double ruled gilt fillet borders, spines with raised bands framed by double ruled gilt lines, each spine with maroon morocco label lettered in gilt in one compartment. , 455; , 387 pp. A fine clean and pleasing copy of this highly important work. The rare contemporary bindings in especially nice condition, the large folding map in good order with only some very expert restoration to a closed tear, not affecting the image, a bit of the typical mellowing to the paper caused by time, an unpressed and crisp copy. THE VERY SCARCE FIRST EDITION IN ENGLISH, preceding the French and German translations. USUALLY THIS WORK IS FOUND WITH TWO PLATES, BUT OCCASIONALLY A COPY WILL HAVE FOUR AS IN THIS EXAMPLE. A very uncommon book in such nice condition and in original contemporary bindings with the extra plates as noted by Cowan I, 237-238: "these four plates appear to have been issued with but a few copies of the work, as two is the number usually found." 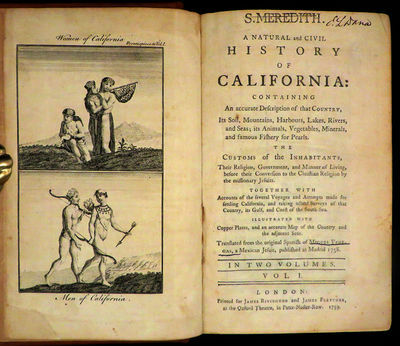 Considered by Cowan to be "the foundation of a library of California," this work is the most extensive account of Lower California of its period. Concluded in Mexico in 1739, the Noticia was extensively revised and brought up to the year 1750 in Spain by Fr. Andres Marcos Burriel, who restricted the account to actual voyages, rejecting all apocryphal material. It was presumably allowed to be published to counteract anti-Jesuit statements that had appeared in accounts of George Anson's voyage in the Pacific (1740-1744). Although concerned primarily with Lower California, it also contains extracts from Lopez de Gomara and Torquemada relating to early North-west Coast explorations, including an account of the 1602-03 Vizcaino expedition, taken by Torquemada from the diary of Father Antonio de la Ascension. Hill I, Vol. I notes that this, the first translation "gave the English-speaking world its earliest thorough account of the little-known areas of the west coast of North America. This work has been cited as the first book in English completely devoted to California." The large folding map is based on Kino's famous Jesuit map of 1702, first published in the 1726 issue of the German collection of missionary reports, "Der Neue Welt Bott". The original Spanish edition contained no plates, but had engraved illustrations as a border to this map. In this printing the same illustrations have been included as bound plates instead. They are of: men of California, women of California, the coyote, California deer, the native manner of curing the sick, the sorcerers of California, the martyrdom of Father Carranca and the martyrdom of Father Taraval. In all, this work represents the most extensive and scholarly study of early California, its people, geography, flora and fauna and the history of the early European settlement from Cortez to the 18th century.